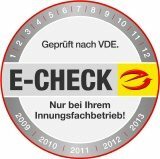 E-check – have all electrical devices been checked? Yes it is, if we’re talking about commitment, team spirit and performance.But it might not be so clear if the question refers to the state of your electrical systems.Things don’t always have to be burned or charred.Indeed, one of Germany’s biggest property insurers has stated that more than 30% of damage to electrical systems can be traced to voltage surges. As the CEO and/or business owner, you carry a lot of responsibility with respect to your employees and colleagues,whose safety should naturally be a top priority. Has the electrical system been tested and inspected to VDE standards? Do inspections take place at regular intervals? It is for this reason that there are strict legislative requirements regarding the regular inspection of industrial and commercial premises. In the event of an incident, you must be able to demonstrate that the electrical system was in proper working order.These provisions apply to commercial and industrial premises. You avoid the high repair costs and subsequent damage that can arise from insufficient maintenance. Your business is protected from unnecessary outages of machines and operating systems. You have proof of the correct state of repair of your plant systems and equipment in the event of any claim involving your insurance company or a professional association. Many insurers even offer discounts on premiums. You motivate your employees by setting a good example in terms of health and safety. Our E-CHECK experts do not just verify your electrical installation; they also check your entire communications system and the electrical equipment in your office to ensure that they are in a proper state of repair, including computers, monitors, fax machines and even door-openers. In addition: many insurers recognise E-CHECK, and offer lower premiums accordingly. Quite apart from the energy-saving possibilities. Your E-CHECK expert from Isoblock Schaltanlagen will be pleased to advise you.